Renovating a property, whether it’s your home or one that you are planning to rent out is a journey; a financial and emotional journey that will test your patience and ability to cope with stress, but will eventually give you a sense of achievement and exhilaration. When embarking on a property renovation project, being organised and systematic is the first step towards ensuring a smooth process. 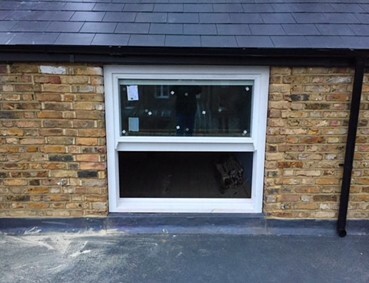 Whilst building your dream extension, basement or loft conversion is exciting and you want to start work with all guns blazing, it’s a good idea to slow things down and take your time in planning every little detail. You’ll be surprised about how many fine points you will need to consider. 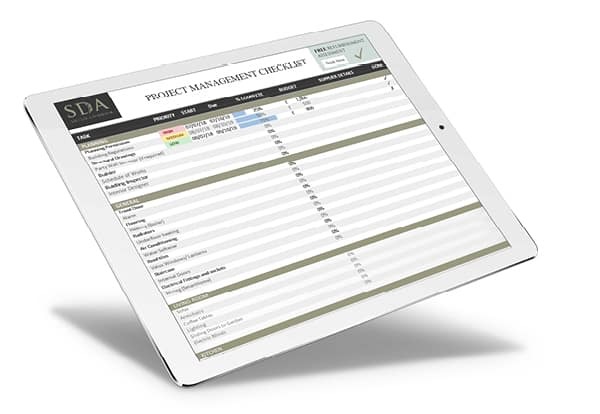 Get started by downloading our FREE property management checklist... Anything & everything about your project in one place… keeping you organised at every stage. This is a comprehensive project management excel spreadsheet that will allow you to add and amend the fields based on YOUR project. It’s the ideal starting point, giving you an idea of all the elements you need to account for. There may be more on your list that we haven’t included; all you have to do is add a row or a column and make the checklist your own. 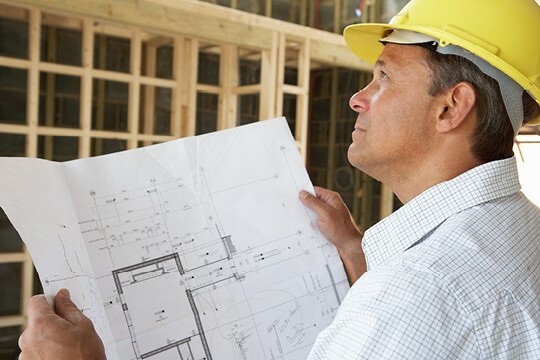 One of the first steps of a property renovation project, if it involves structural work such as basements, extensions or loft conversions, is to hire an architect; this is even before you apply for planning permission as your architect will need to create the drawings that you submit to your council. Your architect is the single most important person in getting your property renovation project started. Without him or her, there is no project. It’s vital therefore, to find an architect that shares your vision, has the necessary skills and creative flair to implement that vision and one that has a working style you can align yourself to. We suggest appraising at least three architects before you make a decision. There are a number of factors that you need to consider before choosing an architect such as knowledge of local council regulations, alignment with your ideas and the ability to find creative solutions to potential planning problems or problems with neighbours. It’s your architect who should guide your through all the regulatory and planning processes as well as liaising with your builder and communicate your vision with them. 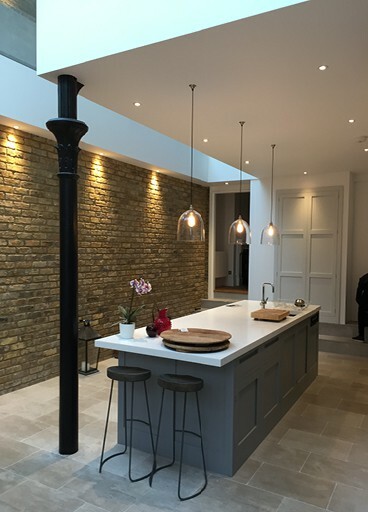 Being an end-to-end provider of property renovation services, we offer a complete architectural Design and Build service, to our clients across London. Our team of professionals in the building industry consists of RIBA accredited architects who will work with you and us to take your project from a building site to a completed property. 1. Have you worked in the local area? Architects who have worked in the area are more likely to know the local planning rules and regulations. It’s important that they understand the local authority planning rules and regulations and know the latest building regulations required. If they don’t, their design might be great, but if it can’t be built, your money is wasted. 2. What are the size of projects you have done in the past? Depending on the size of your project, you need to find out what kind of work the architect has done in the past. For example, if you need a complete rebuild of a large detached house, you don’t want someone whose biggest project has been a side extension. Make sure you see some of the work they have done first hand and speak to previous clients. Ask detailed questions on the architect’s ability to find solutions to problems that may arise during the build (they always do). 3. 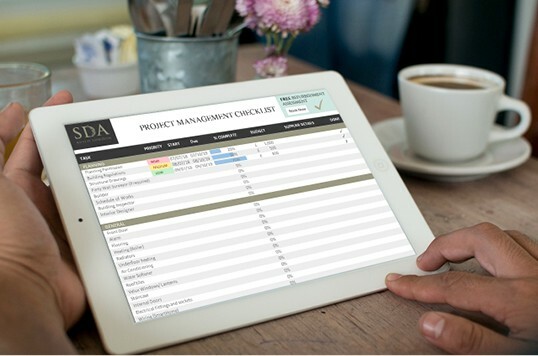 Can you project manage? It’s one thing to create designs for a property renovation project, it’s altogether another thing to manage all the aspects of the project. You need to find out how the architect works. Does he or she give your contractor all the drawings and leaves it to them to implement, or is the architect hands on, managing the various aspects of the project themselves including the builders, electricians, building control surveyors, etc.? This also depends on how involved you want the architect to be in terms of project management. 4. Do you have any areas of specialisation? Again, depending on the kind of work you are doing, you will need an architect who’s experienced in what you need. For example, basement conversion specialists, restoration or preservation specialists, green energy specialists or anyother area of expertise that needs specialist treatment. 5. What would you do with my project? Whilst you may have an idea of what you want, does the architect make recommendations and suggestions? 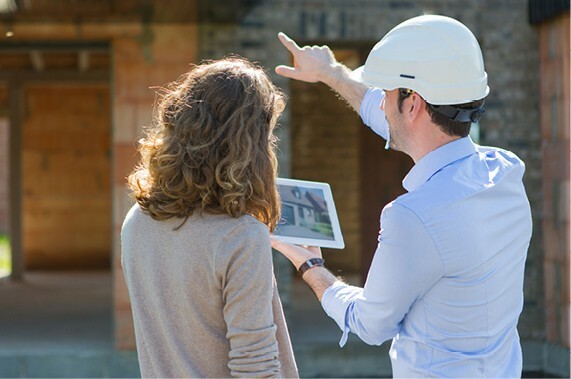 You can gauge an architect’s interest in a project by the time spent at your property in the first meeting, whether they listen to you and whether they have any immediate suggestions. Don’t expect them to give you all their thoughts before you officially hire them, but you should be able to assess their enthusiasm. 6. Do you work with a specific structural engineer? Architects and structural engineers work closely with each other and most architects have their own structural engineers they like to work with. Find out how many projects they have worked on together. 7. How well do you manage timescales? One of the most annoying aspects for a contractor is to have to chase architects and structural engineers for drawings and often projects are unnecessarily delayed because the architect has not sent the relevant drawings to your builder. Make sure the architect is responsive via email or mobile and comes back with answers to your queries in a timely manner or you will spend considerable amounts of time chasing for drawings and responses to any issues that may crop up. Hiring an architect is one of the most important decisions you will make in your property renovation project. Make sure you do your homework by asking for references from previous clients and builders they have worked it and if possible take time to visit a property they have worked on. There’s nothing better than seeing it in the flesh. Book a free consultation in the comfort of your own home and share your design ideas with us. Our team will then come up with a unique solution for you and your home. Most people take on a property renovation project to increase the space in their homes. We’re almost sure it’s the reason you are looking to renovate. Loft conversions, back or side extensions and basement conversions are all ways to add floor space in your home. Also, with stamp duty rates skyrocketing and adding a hefty chunk to the cost of moving, it makes sense to add square footage to your existing space, rather than incurring the pain and cost of moving home. Have you thought about a basement conversion? Imagine the space you could add to your home. If you don’t have the space to extend your space outwards or sideways; perhaps your home is in a busy city centre, adding a living area below your existing property, probably the entire expanse of your ground floor can not only give you the space you need, but add value to your property. Basements are a speciality with the SDA Build team Of course, you will need the necessary planning applications and architectural drawings, but that’s a small price to pay. Or think about doing a loft conversion. Loft conversions usually don’t require planning permission and come under the permitted development remit, but please don’t take our word for it, check with your local council. Loft conversions are ideal if you want additional bedrooms or an office space, tucked away upstairs, undisturbed. Like basements, loft conversions also add value to your home. Whilst you may not want to compromise on the size of your garden, extending out is a clever way of increasing the space in your home. We’ve worked on several projects where our clients have used their extensions to build new kitchens, home offices and family & TV rooms. Again, extensions add value to a home, but you will need planning permission and architect and structural drawings. Not everyone can build basements or lofts or extensions. No matter. Consider using hallways and corridors as spaces of purpose. You can install a workspace, shoe storage, shelving or even a piano to free up floor space in other areas of the house. Try and involve an interior designer to help with the planning. You don’t want to clutter the areas but find creative ways to use the space effectively. Sometimes it’s as simple as rearranging your furniture. Move a sofa here, move a table there, add a shelf on this wall, move your television on to that wall, and there you have it, a whole new space. Moving a bed from the left wall to the right wall or even moving a radiator to another wall could add a whole new dimension to a room. Draw out your rooms with its current furniture positions and play around with moving them to visualise different permutations and combinations. • Bespoke storage – a great way to hide clutter and have a place for everything. • Sliding doors – opens up areas that would have otherwise been blocked by open doors. • Glass walls – give a room a sense of space and light. They are much thinner than brick walls, giving you extra square footage. • DECLUTTER… if you haven’t used it for six months, get rid of it. Decluttering is one of the most undervalued and underestimated methods of creating space. Do let us know if YOU have any ideas you’d like to share. 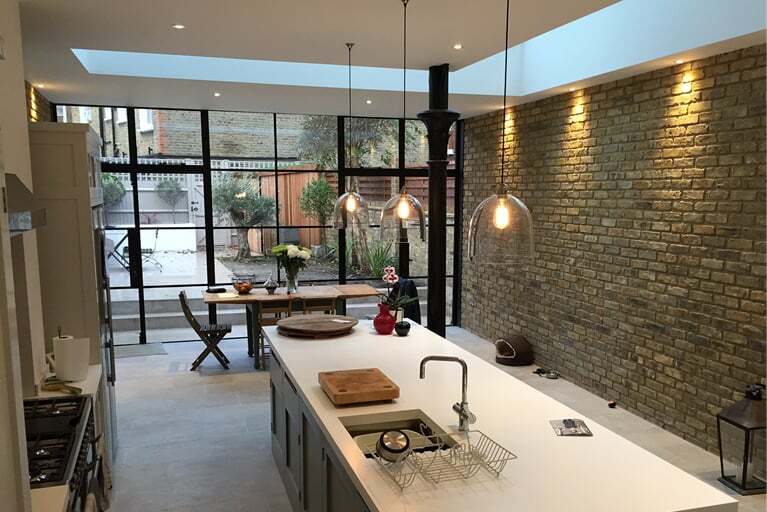 SDA Build London are specialists in basement conversions. We’ve created some stunning cinema rooms and winecellars in basements in homes across South West London. Please do visit our projects page on our website to have a look. Altering the internal configurations of your home is sometimes an easier and cost-effective way to increase space than undertake the challenges of building extensions. Knocking down or moving walls internally can dramatically alter the look and feel of your home. But before you go down this route, make sure you involve an architect and a structural engineer. The walls in your home have been built to serve a specific purpose. Knocking them down without assessing and evaluating their original purpose may have consequences. A discussion with your architect or structural engineer will probably give you the pros and cons of moving or knocking down certain walls and throw up innovative alternatives that might be better suited to your property. Do you need building regulations permissions? Are you knocking down load –bearing walls? What material can you use for supports? Have a read and let us know if you’d like us to help. We have a team of experienced structural engineers and builders who can advise you on the best way forward. We may also recommend alternative configurations and arrangements that you may not have thought of, that may work better, for your needs. If you have decided to go down the extension or basement conversion route, your starting point must be the foundation. This is the most important element of your extension literally your entire home “depends” upon it. Before you start excavating you will need to dig a small section to understand how deep your existing foundations are. It is advisable to call your building control surveyor at this stage, who will be able to advise you on the depth and type of foundation you will require for your project. A foundation will not get passed by building control who will deem it unsafe for habitation if the latest building control regulations and standards are not adhered to. Sourced from the Homebuilding & Renovation website, we found a detailed and handy guide on getting your foundation going and everything you should be asking your architect and builder about it. 5. WHAT ABOUT THE ROOF? Whilst the foundation is a vital part of an extension or basement conversion, your roof is also an important consideration. Should you opt for a pitched roof or a flat roof? Both have their merits and will depend on several factors including your budget, the desired look of your home and the height of your extension. 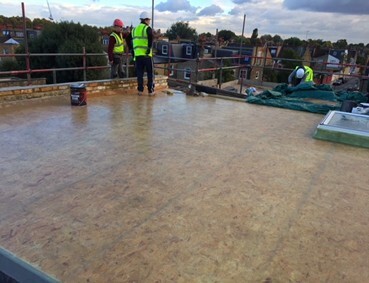 The choice between a flat roof or a pitched roof for your extension depends on a variety of factors not least planning department and building regulation considerations. Flat Roofs are generally cheaper and quicker to build than pitched roofs. This is simply because, they are structurally less complex. 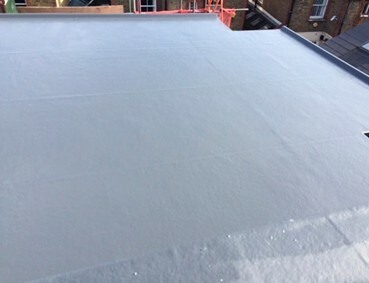 Whilst flat roofs have the reputation of being less resilient and have a lower ‘shelf life,’ new techniques and materials such as Asphalt, EPDM and fibreglass have mitigated this lack of durability label. Avoid using single ply or rubber membranes for the roof as even a small puncture can cause leaks which are difficult to locate and repair. From an aesthetic stand point, flat roofs are not pleasing to the eye, but can be ‘beautified’ by creating a balcony or a roof garden with hard-wearing plants for low maintenance. Usually flat roofs have a lower ceiling, making the space seem smaller. However, with the addition of roof lights or lanterns, the perception of space and light can be created. Top Tip: Make sure your builder knows what he’s doing. Whist your flat roof is essentially flat, it must be at a slight angle for efficient drainage. The last thing you want is pooling water on your roof which, over time, will cause your flat roof to bow. Pitched Roofs are prettier, no doubt, however, they are more expensive to build due to the greater complexity involved in their structure. As a result, choosing a pitched roof over a flat roof will increase the cost and timeframe of your project. With pitched roofs your ceiling can be higher giving your extension a sense of space and light, especially if you add Velux windows. Pitched roofs traditionally have a longer life span than flat roofs as they are deemed to be more weather resistant, have better drainage and have traditionally been built with more durable material. With water draining off immediately, the wear and tear on these roofs is less than their flat roof counterparts. From an insulation perspective, we have found that pitched roofs provide better insulation than flat roofs, impacting your energy bills in the long run. The building envelope is responsible for around 25-35% loss of energy within a building. Pitched roofs are built to allow natural ventilation between the outer layer and the building, preserving energy. Top Tip: If you have a pitched roof that faces the direction of maximum sun, think about fitting solar panels, adding to the energy efficiency of your property. We recommend discussing your objectives and budget with your architect and builder before reaching a conclusion, because every property is different. An experienced builder will be able to assess your property and make recommendations on what’s best for your specific project. Throughout your renovation project, you need to check in at regular intervals to make sure the build is on schedule and within budget. From setting task priorities and allocating budgets to measuring progress, this is a step-by-step guide to planning your property renovation project. The SDA build team decided to put our heads together and give you some pointers that will make your property renovation project as pain-free as possible, within your planned timelines and costs. 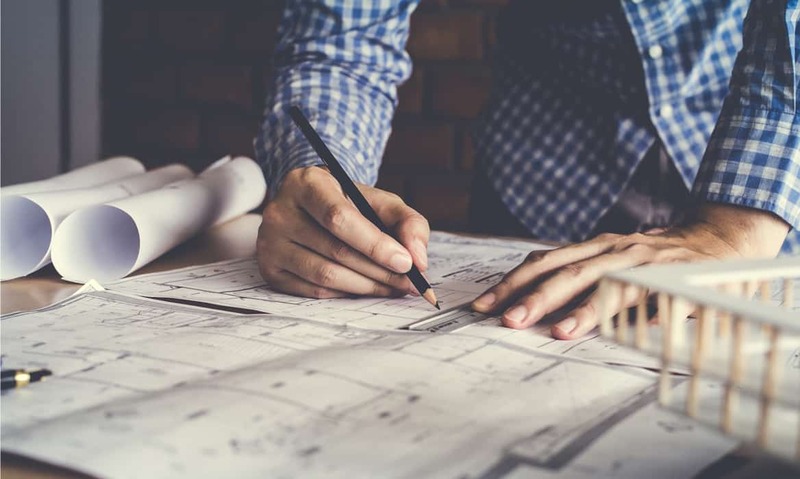 We can’t say it enough, but meticulous planning is the single most important element of a stress-free build making you effectively the project manager. This involves detailed discussions with your architect and builders on timelines and schedules and whilst you may seem pedantic to them, it’s the only way to keep the build on track and within budget. If, however, project managing is not your forte and you’d rather have someone else do it, you can hire a professional project manager; one who can keep your builder and architect moving. Whilst SDA Build London is essentially a building contractor, we provide a complete end-to-end service and not only undertake the building work, but also project manage the entire process from liaising with architects and surveyors to sourcing suppliers and designers. 6. SHOULD I STAY OR SHOULD I GO? It can be very exciting to schedule and plan the design of your new property to make it your dream home. But is it better to wait until the home refurbishment is over or move in first and start that way? The SDA Build London Team are asked about this dilemma several times and obviously, there are pros and cons also depending on your situation. have lived through the build or have moved in before the build is fully finished. There are however, some situations where living in the property during a renovation is out of the question. Alternatively, there are some cases, such as back extensions for example, where you could carry on living in the property, albeit with some disruption and discomfort. Whatever the situation, undertaking a property renovation project is exciting, daunting and everything in between. We hope we’ve made your property renovation project just that little bit easier with some tools for managing it and some ideas drawn from our years of experience. Please don’t hesitate to contact us if you have any questions or would like to chat about your upcoming renovation plans. We’d be happy to book in a FREE consultation where a member of our team will visit your property, discuss your plans and share some of our thoughts on your property.